Hello everybody! I hope all of the Americans out there are having a good Thanksgiving, with tons of turkey, mashed potatoes, stuffing, and football. 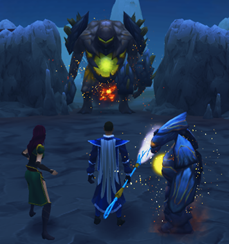 We now have a guide on Heart of Stone, the latest quest in RuneScape. We hope it helps! The Fishing Training Guide is now updated with more modern training methods, although we could still use some help with pictures. There's a new poll up! Who is your favorite Mahjarrat? Is it Zemouregal or Azzanadra? Is it Sliske? Do you even know what a Mahjarrhat is? Finally, our forums recently turned 10 years old. Happy Birthday Sal's Realm forums!